You are here: Home / #TLBSupportForward / Why Would You Wear Your Toddler or Preschooler When They Can Walk? Why Would You Wear Your Toddler or Preschooler When They Can Walk? This post made possible by the generous sponsorship of Beco Baby Carriers. Photo credit: Your Street Photography, Meghann Buswell. Love this carrier? There are only two like it the whole world and you can win the other one by going here! Once upon a time I found the whole idea of wearing a child who could walk completely… ridiculous. Seriously, how is that helping them? They can walk, you’re just trying to keep them little longer and probably inhibiting their development. WHAT ARE YOU GOING TO DO, CARRY THEM ALL AROUND THEIR COLLEGE CAMPUS? I figured if you kept carrying your child after they learned how to walk, you’d end up looking like this. Then I had a kid. Our first turned out to be a late walker and didn’t really become mobile until between 15 and 16 months old. By that point the other toddlers in our circles were running circles around her and I began to panic, in spite of our pediatrician’s reassurance, that she was never, ever going to walk. Worried that her my dreams of an Olympic gold medalist were fast slipping out of reach, I become a little pushy to get her to walk. And also because carrying her was killing my back and arms, back then we didn’t have any carriers with a high enough weight limit and I just plain didn’t want carry her. 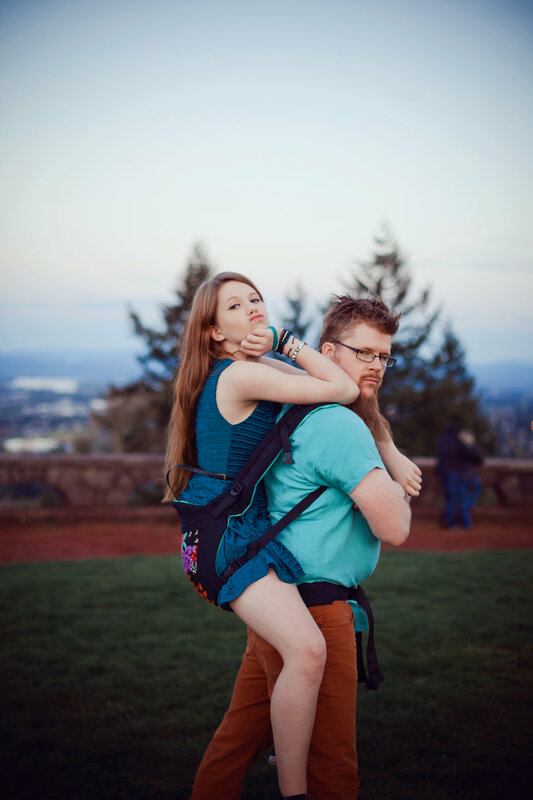 Well meaning people around me warned that she was just using me, being lazy, and would never become independent if we “let” her make us carry her all the time. We were “spoiling her” and we’d have to carry her FOREVER. So I pushed. Walk, you’ve got two legs, use them! Besides, you have to become self sufficient and independent some day. Sheesh. You guys, she was really still just a baby. But even after she started walking she wanted to be held a lot. In fact, she was timid and scared and insecure. To “help” her through that, I pushed her to be more independent. I’m not proud of this, in fact, it makes me sad. Looking back, me pushing her to walk when she wanted to be close to me was really a jerk thing to do. I would refuse to carry her or carry her for just a moment and then put her down even if she wasn’t ready. My fears were completely unfounded, today she walks and runs and dances ballet just fine. Not only that, after some therapy and healing, she is a self sufficient independent introverted 16 year old who has taught me that connection is more important and respecting individual personal ways of interacting with the world is what makes you not be a jerk of a parent. She didn’t need me pushing her to walk, she needed me available for lots and lots of connection until she was ready. To this day she prefers to observe the world from a bit of a distance before racing into it. But when she does race in, watch out, she has found her confidence and her voice to make a difference. Since our eldest taught us about respecting our children as individual people, we’ve had 5 more children but it wasn’t until our 3rd that we began to wear our toddlers on purpose. Another introvert, our third daughter felt safest close to a parent and would for several years. Meaning when she was three and four, she still wanted up in certain settings. Instead of traumatizing her with environments she wasn’t ready to navigate independently, we listened to her. When she was ready, she would progress into the world around her on her terms and now confidently moves through the world secure in her steps and returning to us to share her adventures and discoveries. Now, with our almost 3 year old Sugarbaby, we let her set the pace for how she interacts with the world. All 6 of our children have unique personalities, some have loved being close and super snuggly for a long time, others just have moments they need to check in before rushing off again. Every single one of them has, at times, requested to be held and carried even after they could walk. Sometimes for physical reasons, sometimes for emotional reasons. All of their reasons are valid. And so far, of our older girls, they each also reach a point where closeness doesn’t require us carrying them and we grow together in developing other ways to connect. Because it turns out, you can’t spoil them by respecting them, they will eventually not want you to carry them everywhere. Last year, just before she was 2 years old, Sugarbaby accompanied us to India, a culture of amazing people that adore children and love to touch young ones. Another introvert (we have a pretty even blend of introverts and extroverts in our home), she quickly learned 2 things: how to clearly say “go away, don’t touch!” and “Beco up!” From her safe position on my back she would offer high fives to the people who wanted to hold her, kiss her, and touch her face. Happy and secure in a place she knows to be safe, she interacted with those we encountered in a way that respected her unique way of being in the world. She runs, dances, jumps, and climbs freely but when she needs to be close or when her little legs are tired from all that exercise and strengthening, up into a carrier she goes on mommy, daddy, or even a big sister. 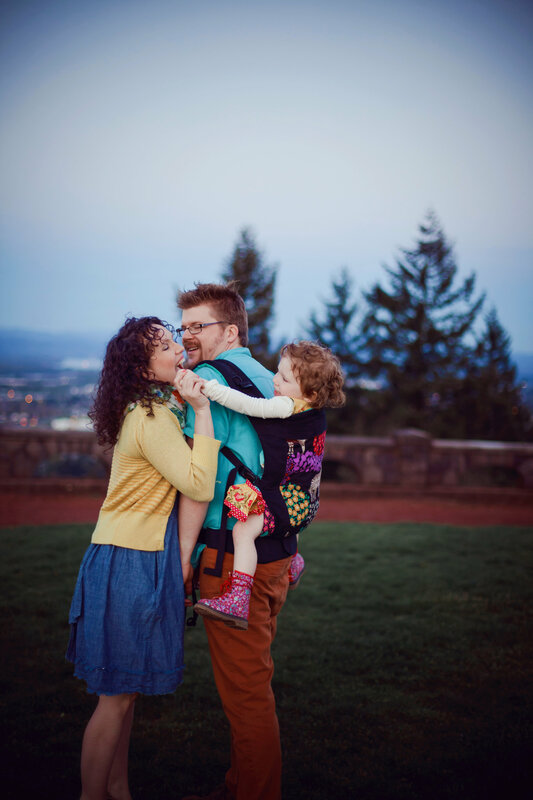 Our long family walks or forays into downtown to go to markets and explore happen with a combination of her walking, running, hoping, and twirling (always twirling, she doesn’t really walk right now, she twirls everywhere) and when she’s tired, on somebody’s back. Occasionally she keeps me company during meal prep on my back when she tires of her spot on a stool. And from the spot on my back and sometimes on my front she whispers in my ear “I love you mommy.” I don’t know how much longer she’ll ask to “Beco” but I’m willing to as long as she does. For me the question isn’t why would you wear your toddler or preschooler, the question is why wouldn’t you. 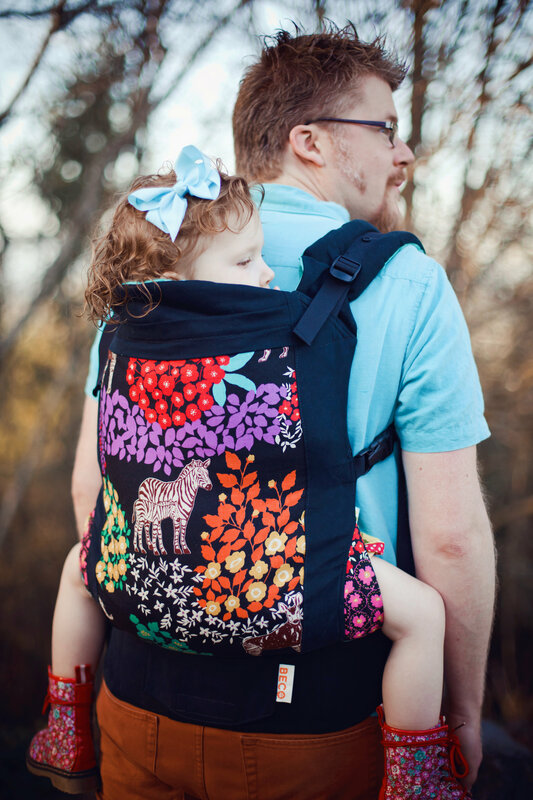 Want a shot at winning a carrier just like the one in the photos here? Enter here! Not only does touch heal, soothe, and connect, neuroscientists have found that physical human contact activates the brain’s orbitofrontal cortex, which is linked to feelings of reward and compassion. All good stuff! Touch can reduce stress. Young children often ask to be held when they’re experiencing stress such as fear, anxiety, or uncertainty and for good reason, touch can calm them, lower their heart rate and blood pressure, and of course releases positive hormones such as oxytocin. Wearing a child who is experiencing stress can provide them just the support they need to successfully navigate that stress when they’re ready. Young children can become overstimulated quickly, having a safe place to work through that overstimulation can mean the difference between a toddler becoming a destructive force in the world around them, having a meltdown of tears and screams, or observing and interacting as they see modeled from their safe perch on a trusted adult’s chest or back. Running. Need I say more? Parents are all excited when their baby learns to walk but in a no time they realize their excitement was misguided. Walking leads to running. You know what you can’t lose at the children’s museum? THE KID STRAPPED ON YOUR BACK. Sure, you have to let them down from time to time but when their running is running you ragged and reminding them to walk 3,342,438 times has made you horse, a ride on mama’s back (hey, let’s play horsey!) is a relief. Strollers are awesome, a great tool and we use ours still. But strollers are not always awesome. The view is limited for the rider and sometimes the world just feels like an obstacle course when you’re dealing with one. An assisted piggy back ride with a carrier is much easier to contend with than a stroller in many settings. They love it. Not always and as they grow in their own desire of “I DO IT!” they will have times they most certainly do not want to be worn. But toddlers and preschoolers aren’t really much bigger than babies and they still love to be close. And that’s the best reason. There are plenty of times in life where we have to tell our children no and deny them what they think they want. Being close, being held, having our touch should never be one of them. 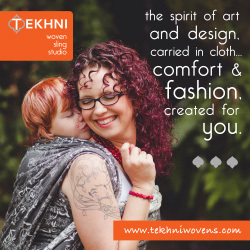 Do you wear your toddler? Want to but aren’t sure if you should? What are your thoughts on toddlerwearing? For a limited time you can enter to win the same carrier pictured in this article by going here. You can’t overwear your littles. It’s important for kids to get all the snuggles they need. Wearing my 3 year old gives her the safe haven she needs when she’s feeling overwhelmed or scared. I hope you’re proud of yourself. You just made this three-days-post-partum mommy cry her face off! Your descriptions of your girls and family in general are very moving and I love that you’re a toddler/preschooler-wearing convert. Love this! I never thought I’d be a toddler wearing mom but the carrier is a life saver in so many situations from public tantrum moments to crowded museums to public transportation. It keeps my little one safe and secure and provides him with a private space for breastfeeding discreetly or taking a nap. I love love love my carrier and so does dad! Dad is a coach and sometimes he wears our son while coaching. In fact he’ll be wearing on Saturday when his kids have a track meet and I have to take the NCE exam. I would wear my toddler in this because no matter how big she grows she’s still my baby:) and being too close or cuddling never hurt anyone! I would wear my 10 month toddler because she love it..
My daughter has an iron deficiency, we still “baby wear” her on long walks so she doesn’t get to tired! My 3 year old has asthma, gets tired and short of breath quickly. Having an asthma attack is scary for her, and me- and she likes me to hold her, but she’s a bit heavy to just carry on my hip for a time. She likes to be on my back for a “back ride” but then she chokes me hanging on! I have two little ones… 3.5 year and 18 months. I wear the youngest because I would completely lose my mind trying to chase down two at the same time – I have some SERIOUSLY active children. 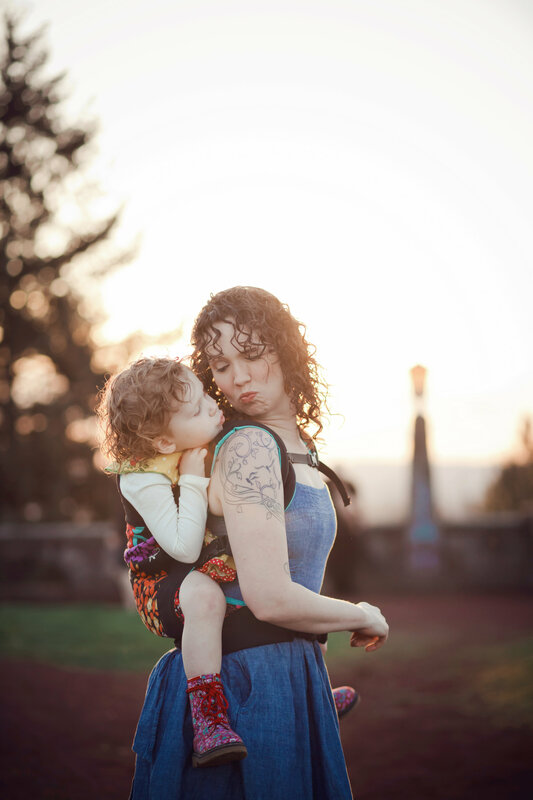 Honestly my oldest would prefer to be worn more often but she’s too tall for our standard Tula (though still just 25lbs) and it is really uncomfortable for me to do so. When I have to carry her in my arms while wearing her little brother it is pretty rough for this mama.